Behold our gratitude, our exultation! We wake from death in tears of warm compunction. Streaming suffering your phial of consecration! O King and Prophet, Priest of all creation! "O Bonitas!" Hushed to Silence: a selection of poems by a Carthusian Monk, chosen by Robin Bruce Lockhart, Herefordshire: Gracewing (2001) 62. Is contemplation an uninteresting wilderness? Many religious who have dedicated their whole lives to prayer can speak like this, including authors like Thomas Merton. These kinds of expressions suggest those purgative experiences in prayer where our conversation with God takes on a kind of monotonous tone. It is like that part of an adventure where nothing seems to be happening and everything looks the same. Those who suffer this find themselves wandering, searching through a forest of unanswerable questions: Is He asleep? Why isn't something happening when I pray? Sometimes prayer can seem boring and can even feel like a complete waste of time. This can be dissatisfying and even discouraging. Yet this is a part of the journey of prayer and, as a character in a Tolkien story observes, not all who wander are lost. In this real adventure, each step potentially unleashes into the world the transforming power of Divine Mercy if we allow ourselves to be guided by love. Prayer can be extremely difficult when we do not understand or have real feeling about what God is doing. And, sometimes, the Lord can choose to keep us in the dark about his mysterious purposes for a very long time. Only after we have grown accustomed to the vast expanses of unfamiliar horizons does the apparent lack of consolation begin to disclose its beauty to us. We sometimes glimpse, if only for a rare and transitory moment, a greater interior freedom, a real humility, a deeper strength, and a firmer sense of purpose. A bold desire to glorify God with an unflinching resolve has taken hold. In our dryness, we know these movements of holiness in our heart did not come from ourselves - they are the fruit of Someone else's life born in us. St. John of the Cross was so at home with this prayer, he came to see it as a sheer grace, a providential moment of pure luck. This is because abiding with God is our true home, the end of the journey we have undertaken. But He is "so totally other" than that with which we are comfortable, to find Him, He must lead us beyond what is comfortable and into a truly tedious vulnerability. It is as uninteresting as death on a Friday afternoon. Yet it is through this wilderness that we must pass if we are to live life to the full -- if we are to know the joy of possessing the One who longs to possess us in love. "The 'next america' we now see emerging--an America ignorant of or cynical toward religion in general and Christianity in particular--shouldn't really surprise anyone. Its a new America, but its made in America. We can blame the mass media, or the academy, or science, or special interest groups for creating the environment we now face. But we Christians--including we Catholics--helped shape it with our eagerness to fit in, our distractions and overconfidence, and our own lukewarm faith. "Too many people who claim to be Christian simply don't know Jesus Christ. They don't really believe in the Gospel. They feel embarrassed by their religion and vaguely out of step with the times. They may keep their religion for comfort value. Or they may adjust it to fit their doubts. But it doesn't reshape their lives because it isn't real. And because it isn't real, it has no transforming effect on their personal behavior, no social force, and few public consequences...Whatever it once was, now it's dead." A Heart on Fire: Catholic Witness in a New America is a easy read -- but tough medicine good to pray over in these final days of Lent. The heart has a sacred depth set aside for God which will not suffer the coercion and manipulation of any worldly power for long. Into this silent depth, the Word of God speaks and liberty is conceived. That Word shines with divine splendor, the fire which Moses beheld. The saving truth the Word reveals opens to the pure freedom Elijah heard whispered in the breeze. In Mary, this humble Word has wedded our weakness and our humanity is pregnant with a power not of this world. When this Word of Truth comes to the heart, He gifts it with a sacred sovereignty, the ability to choose the most wonderful possibilities, unsurpassed blessings the whole world yearns to know. Here bursting with jubilation, we have at last a moment where real self-determination triumphs. Here overshadowed in unfathomable love, even if beset by all kinds of weakness and inadequacy, we find the courage we rise up and unreservedly offer ourselves. Such is our moment to thrive, to live to the full, to finally "be" who we really are, who we are meant to be - in assenting to this moment we stand in faith ablaze with the dignity of the children of God, we freely bow in adoration before the saving truth astonishing disclosed in the wonder of the Word, we joyfully cry "I have come to do your will." When Gabriel disclosed the Lord's message to the Virgin of Nazareth, she was afforded this freedom in an amazing manner, for an astounding purpose. To the one who is "Full of Grace," God's message was not merely informative; it was pure transformative love, a moment of true human liberty. In that instant, all the fear and lack of trust that has haunted humanity and oppressed it was lifted. The promised victory of Good over Evil was at hand. The Daughter of Zion's decision to act, to trust, to love, to hope in God's promises opened the whole world to new life and restored all that is sacred about our humanity..
What her decision conceives lives deep in the heart of all those who yearn for the Truth. It is about the sovereign dignity of the son’s and daughters of God. It is about our bold access to His saving power which by this sacred liberty we must share. Because of this Woman's courage, the Light that shines forth in the darkness reveals the silent power of God's faithfulness against the cacophony of idols continually imposed on us by heartless systems of ideology and coldly calculated narratives of the entertainment industry. What dehumanizing myth or wicked power is not laid bare before the One who humbly suffered unto death for our sake? Because of his Mother’s trust, against every attempt of political, cultural and economic tyrants to coerce the consciences of men, the Word made flesh resounds in every generation as the inexhaustible source of a love no power on earth can long suppress. To hide in the wounds of Christ and to draw strength from his passion, this is what the mystery of the Mass opens to, and this is especially true for those who suffer. The prayer Christ offered the night before He died is the source and summit of all prayer, even the feeble prayers of those who feel unable to pray at all. This is why Christian prayer has a sacrificial character. Since the Last Supper, all genuine prayer flows from and leads to the Cross, and it is the august mystery of Christ crucified into whose arms we are meant to be raised when we raise our hearts at Mass. Devotion is not always something we feel or stir up, and when we are enduring hardship, often the greatest act of devotion is that we have made ourselves present, that we have made the effort to ponder when attending to anything at all seems all but impossible. Attentive devotion at the Sacrificial Banquet does not exhaust the work of prayer -- the effort to pray before the liturgy and after the liturgy fans the flames of love that should burn during the liturgy, even when we cannot feel them. When we consider the great price by which we have been redeemed, we know we must, no matter the burden we carry, constantly make the effort to meditate on the Word of God if we are to recognize Him in the Breaking of the Bread. Yet it is during the liturgy as at no other moment that Christ gives himself to his Bride, the Church. And we, his Mystical Body, are washed by the water that flowed from the side of Christ and here we are also inebriated with his Blood which has been poured out for us on the Cross. In this mystery of Christian prayer, if only for a moment and if only imperfectly, we share in his suffering, a divine suffering which transforms human misery, including our own personal misery, into something beautiful for God. Torrents of tender mercy are unleashed onto world when we pray with loved filled thanksgiving for so great a gift. This is to hide in his wounds. Hidden in his wounds, nothing - no power on the earth below or in the heavens above - can ever separate us from his inexhaustible love. Filled with his love, those hiding in his wounds draw strength from his passion and become a source of invincible hope for the world. Calmly losing ourselves in the will of God is what Blessed Elisabeth of the Trinity recommends to those who desire the freedom to live by love every moment of their lives. The greatest obstacle to love is our own bloated egos. The gravity of self-occupation pulls us into ourselves and fills us with fear every time God tries to pull us out of ourselves. Trusting God, looking to Him, relying on Him is impossible as long as this gravity exerts its influence on our hearts. This is why the Lord sometimes permits us to suffer a difficult loss or failure or painful trial. If He allows us to be tried all the way to the breaking point, being broken and humbled is not the end of the story. It is simply a new beginning where we learn that deeper surrender that allows God to do great and wonderful things. In such moment, it is by trusting Him that we live life to the full. St. Catherine of Siena says our faith makes us lambs who roar like lions. She has touched on a great paradox: To say "I believe in God" is both the establishment of peace and the declaration of war. When we believe He exists, when we believe what He has revealed, when we believe because of his great love, we are like lambs who follow the Lamb of God. At the same time, to believe in God is to take sides with the Author of human dignity and the Vindicator of all that is owed this dignity. Whenever the freedom and dignity of the human person is at stake, we must roar like lions. If we rise for battle, our enemy is not flesh and blood. This is true even when those driven by arrogant hubris build new towers of Babel to wage war with Heaven. The rich and the powerful can abuse their social, cultural, political and financial authority with chilling cruelty, but they cannot separate us from the love of God. Attempts to mock, deride, belittle, marginalize or persecute those who try to live their faith merely signify the hostility towards God which lives in the hearts of all of us. Just as a disease is healed not by combating the symptoms but by dealing with the cause, Christ Crucified has definitively addressed the cause of our hostility to Him. People of faith are those who allow themselves to be used to apply His medicine. To fight for hope, to save human dignity from the hostility that would destroy it, we must care for the sick, clothe the naked, feed the hungry, defend the oppressed, comfort the lonely, and bring relief to the poor. Against an entertainment industrial complex which mocks everything that is wholesome, we must promote healthy marriages, vibrant family life, the dignity of work and the rights of those who labor. Any affront to human dignity and freedom is another front in our fight for the truth. Yet this battle is not limited merely to the public square and the marketplace of public opinion, we must also take the fight to those places in our own hearts in which vestiges of this hostility still linger. In this effort, even if we temporarily fall short, our hearts are sealed with the sign of our victory. It is a sign of love. It is the Sign of the Cross. And so we pick up our Cross. This is our act of faith. To believe like this is to choose sacrifice, all kinds of self-denial, and whatever else it takes so that everyone in our lives might thrive, realize all the God-given potential lavished upon them, and, most of all, discover that they too are loved beyond all measure. What does this mean? Sometimes love will demand that we courageously speak the truth, that we speak for those who cannot speak for themselves. Sometimes love will demand that we bear things silently, trusting in our loving Father to shelter us when everything we hoped for seems to have been dashed to pieces. Sometimes love will demand that we return a blessing for a curse and that we seek the dignity with which God has endowed even our persecutors. Sometimes love demands that we must forgive and beg forgiveness. Love will rebuild what we have destroyed. The love faith makes possible is stronger than death. How can mere mortal flesh stand in the way of God when Love by becoming flesh has made our mortality itself a threshold to eternity? The ancient Romans learned that no law or mandate or edict or enforcement of court order can stop love. Nazis and Communists learned that turning people of faith into outlaws and criminals cannot stop love. Should constitutional republics devolve into a mob's tyranny, these tyrants, like those that went before them, will also learn that the meek and lowly can be humiliated to the point of physical harm, but love cannot be overcome. The true Christian in fact learns to see all of this as a great blessing: to suffer for the love of God only means that God has found one worthy to follow the footsteps of the One Crucified by love. When we step out in faith against the powerful cultural and political forces of our age no matter how feeble our effort. our Vindicator will step forward. And we must rise. The blood of the unborn - these our own sons and daughters, our own brothers and sisters, our own neighbors - their blood screams out to Heaven. What peace can we have until their voice is heard? Their still silent cry calls to us and reverberates with the even more silent cry of God. Those who know this heart piercing silence lose all fear of suffering or sacrifice or renunciation or trials or ridicule or rejection. In the peace of Christ, they are prepared for war. Is heaven worth it? Some are afraid that the end goal of our Christian faith is dreamy clouds, bland cream cheese, and boring elevator music. They fear that the only peace our faith promises is the absence of adventure, excitement and fulfillment. In other words, they consider Christ as if He were some old dead thing. Well, at least this is the way they look at his promises. Ever wonder what goes through the heart of the Lord when He sees this in our hearts? For my part, I have never met anyone who really knows the Lord and was bored at the same time. People of real faith always seem to be trying to fit an eternity of living in a life too short to contain it all. I have seen octogenarians come alive with the excitement of a child with the very mention of the Lord and frequently I have been humbled in the face of their apostolic zeal. On the other hand, I once met a young man not yet a teenager yet very sick with cancer. He did not seem very aware of how sick he was. Instead, he was filled with God's love and filled his days making rosaries for people to pray with. Even non-Catholics accepted his work with puzzled but heartfelt gratitude; his joy was so contagious! Those who are faithful in their love of God propose that He is the fulfillment of all desire, the center of unremitting activity. They identify this dynamic experience of God with a kind of spiritual fire or fire of love. In Christ, they have discovered a new life which burns in them and animates them with a joy beyond the boundaries of their own egos. Such a life is ever new, ever youthful, even in those who approach the end of their days. The more they share with God, the more truly themselves they become. His love, rather than boring, is delightful for them because it ignites in them a freedom to love, a freedom in which they rejoice. When Blessed Elisabeth of the Trinity suffered the final agonizing months of her life, she experienced God as an en-kindling fire of love whose sparks delightfully transformed everything they touched. The delights of the divine en-kindling are renewed in our depths by an unremitting activity: the enkindling of love in a mutual and eternal satisfaction. It is a renewal that takes place at every moment in the bond of love. Heaven is about this same bond of love: an exchange of hearts so intense, so rich, so beautiful that every desire and hope is surpassed. The soul is enveloped in an exceeding love and shares a joy with God which is intensely mutual. The joy of the soul in being loved by God and the joy of God being loved by the soul are so reciprocal that one loses the sense of where the frontiers of the soul end and the horizons of God begin, and this losing of oneself in this exchange can happen over and over again. It is possible to choose this bond of love as one's life refuge, the place from which to draw strength during this earthly sojourn. It is no escape but rather the only way into what is really real. The reality of love - this is our life's adventure, this is what makes life worth living. It was purchased for us at great price. It is a gift for which we must ask. It is an art which we must learn. Click here for a podcast of episode seven of my discussions with Kris McGregor on Blessed Elisabeth of the Trinity's Retreat Heaven in Faith. We must pray for everyone affected by storms that hit the South and the Midwest and storms in recent weeks in Europe -- in these disasters death took whole families, children, parents, neighbors and friends. We must pray for all those overwhelmed by such natural disasters. We must also pray for the vulnerable all over the world, those who suffer in the grips of terror, especially those victims of heartless violence and hatred. How many of those left behind in these devastating storms and how many survivors of the diabolical cruelty unleashed in the world today are questioning their faith or well be left questioning it for years to come? For those who draw close to God, they share his tears and they know they must pray for their brothers and sisters whose hope is now so tested. The Living God is not indifferent to our plight and as long as his children suffer, His Heart aches for them. He stands in solidarity with each of us in every situation. In our hunger and thirst for justice and in our need for safety from danger and for comfort in sorrow - He stands firm in his devotion to us. Though it is beyond our power to understand - his love and wisdom have not changed. His glory is being revealed even if we cannot see it, even if it is disguised beyond recognition in the misery that engulf us. God who has created us and saved us and who longs for each of us to thrive loves each one with a particular love: each one's personal plight is his plight too. Every single life is treasured by Him and He longs to wipe away every tear. He knows our suffering. He hears our questions and He empathizes with our helplessness. He mercifully waits for our humble trust - and those who cleave to Him in the midst of trial discover the reason for their hope. Our Crucified God has implicated himself in our personal tragedies in such a way that He suffers with us out of love so that we never suffer alone. It is in the mystery of the Cross that the victory of good over evil is found. If we must walk the valley of death, His Love is stronger than death - no storm or disaster or oppression or persecution or sorrow or trial can overcome it. Nothing can separate us from the love of Christ - He vindicates our faith even in times of overwhelming calamity and incomprehensible evil. He is always the substance of our hope. If He has bound himself to the suffering, by the love that binds us to Him we must draw near our neighbors who suffer as well - with our words, and actions, and our prayers. This is what it means to be in his image and likeness. It is in such moments of solidarity that our hope is tested - and our hope will not disappoint. 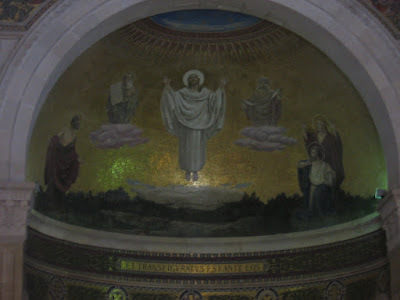 What does it mean that the apostles witnessed Jesus on a cloud covered mountain clothed in dazzling light in dialogue with Moses and Elijah? On the mountain in the cloud and darkness, we are reminded of the transcendent truth revealed in Christ, that this is hidden wisdom given only in faith, and that faith itself is like the ascending a mountain - each step raises us higher into God's mystery and deeper into purity of heart. In the light and glory of this moment, we see the Gospel of Christ contemplated in the Law and the Prophets. As Christians, we must not be ignorant of the Bible but prayerfully reflect with the eye of faith on the wisdom of God which imbues the Sacred Page. What does it mean that the apostles heard the command of the Father? It means the ear of the heart must be open to the Word of Truth in all the hidden disguises He comes to us. When we find the Beloved Son in those God has entrusted to us, we must never leave Him, we must strive to serve to Him with all our strength, and no matter the cost we must follow Him in everything. He alone is our hope on prayer's pilgrimage from Mt. Tabor to the Hill of Calvary. The exceeding love of God is why my imagination, feelings and thoughts are of such limited value when it comes to prayer. Being mindful of holy things and stirring up sentiments of devotion gets us started - but beyond my words, feelings and thoughts there is a poverty of heart from which prayer springs. A humble surge of the heart reaches for the Word of God, the Eternal Word, the Word become flesh - if only to touch the hem of his garment. In this spiritual emptiness, He is able to fill the heart with his own divine yearning, supernatural desires that go beyond all created ability to articulate or comprehend. A fire of love which consumes one's whole existence begins to burn and love's vulnerable wordless cry echoes again, just as it did on the Cross, to the glory of God the Father. In this simple, wholly loving movement one learns the total surrender which utterly frees us. Here, the silent discovery of a simple look of love annihilates every dehumanizing fantasy, sentiment and judgment. At the same time, gazing on the One who gazes on us in love raises up on high all that is good, noble and true.